Now make some drawings of the same subject as before in other colour media. Experiment with mixing the media. Use pens, wax crayons, ballpoints together with pencil, crayons and pencil. 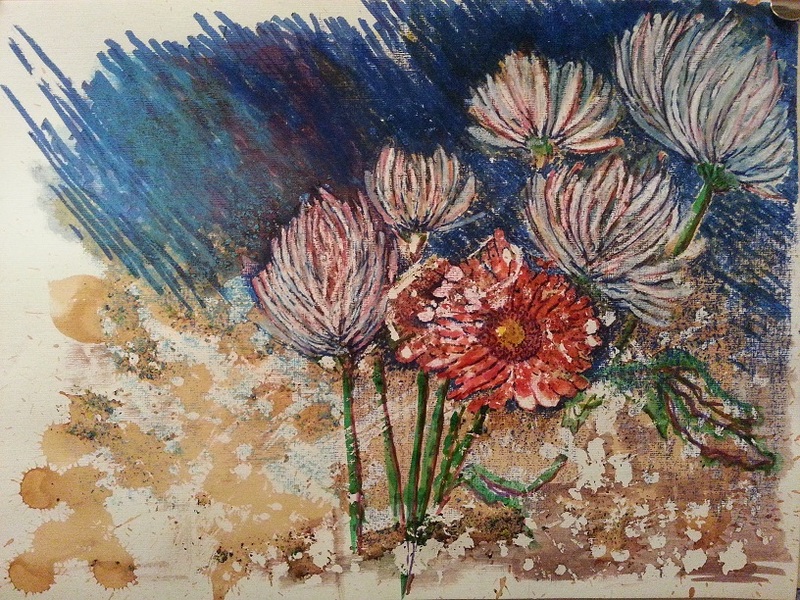 Using acrylic paper, I chose the chrysanthemums and the gerbera to simplify the composition. I decided to keep the same style of composition by keeping the objects to the to the right hand side of the page and the light source from the right. For this exercise I used oil pastel and watercolour markers. By using acrylic paper I could use water based media. First I used a graphite 2B pencil to loosely draw in the flowers. I drew over the lines with a white wax candle and the wax smudged the graphite to give a lovely line. I then randomly splattered masking fluid over the page concentrating more in the lower right hand corner. 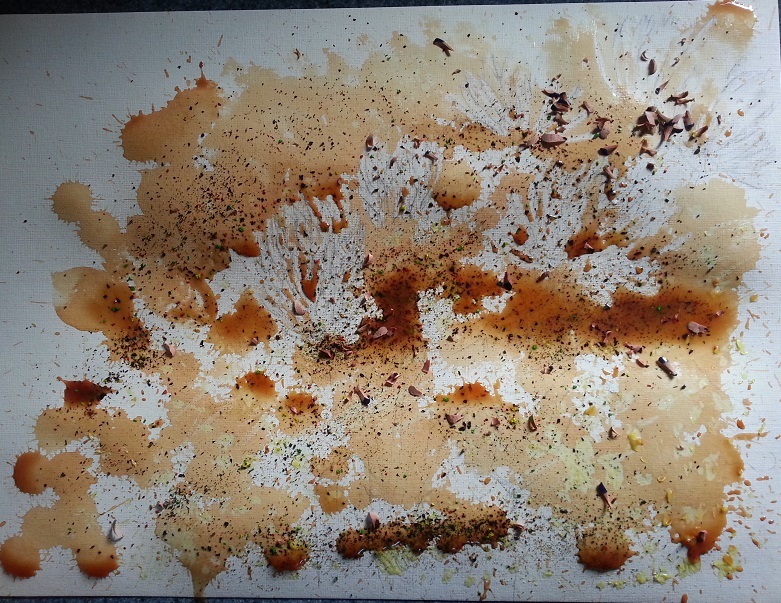 After this had dried I stained the paper with tea. Whilst the tea was still wet and puddling, I sprinkled the sharpenings from the inktense pencils that I had saved from the previous exercise, wood and all. Whilst the paper was drying, I thought about how to use the mixed media. Because the coloured pencil drawing was tight and controlled, I wanted to be loose and expresive with this drawing. The colours of the flowers were pinks and reds and the background paleblue, so I thought I would try mixing the oil colours on the page to blend them together. Once the paper was completely dry, I brushed off the bits of sharpenings that hadn’t stuck. The bits of wood and lumps of colour had really stuck fast and I thought I would leave them as they would probably come off whilst being worked over. I thought that there would have been more colour bleed, but the colour remained mainly in lumps. I removed some of the masking fluid so I could remove the remaining once the drawing was complete. I worked oil pastels over watercolour markers and vice versa to build up the colours. The tooth of the acrylic paper picked up the oil pastel and gave a nice effect.